We are chartered accountants, tax and business advisors. 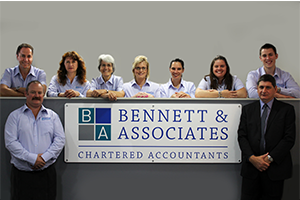 Bennett & Associates has been providing tax, business advice, assurance services and business reconstruction/turnaround management to the Whangarei and the Northland community since 2002. Our focus is to provide a broad spectrum of accounting and financial advisory services to our clients. Management and Support. We are also trusted advisors to the Government, regularly providing services to four separate Government agencies. As a cornerstone to our firm and for the benefit of our business services clients we strive to ensure that our Client Managers are assigned smaller individual portfolios than that of our competitors. The advantage being that we can provide a greater level of direct personal service. Our team consists of a total of 10 staff. We have 2 Team Support Angels and 8 Client Managers, 4 of whom are Chartered Accountants. This balance provides the right mix of experience, knowledge and skill base to ensure that our clients receive the services they deserve. If you’re looking for a Chartered Accountant who is not just about tax compliance, who will help your business thrive and prosper and who provides valuable advice and support, then talk to us. Being a small, local business offers many distinct advantages. We offer a better, more personal service, better attention to your businesses details and as a local company we offer a local perspective, and experience in the areas where your business operates. A Firm With Specialist Divisions. With a background in Assurance Services and Insolvency Management the creation of a firm with specialist divisions was a natural progression. Working for Maori Economic Prosperity. Bennett & Associates has always strived to support Maori Enterprise, and this passion has let to the fomation of another, specialist division of the firm. Bennett & Associates have been whanau orientated from the beginning. There is a feeling of respect and equality amongst the team at Bennet & Associates which is reflected in the firm having the lowest staff turnover rate in Whangarei. These same values extend to the clients.